"Intuition can supplement logic in problem solving and decision making but it has been unjustifiably ignored in modern times. Dr. Emery�s inspiring book should provide a greatly needed antidote. Its exercises are creative and practical, and its advice is sensible and well-articulated. These materials are applicable to dozens of settings including those at work, school, and in personal relationships. I doubt that those people who read this book and undertake the suggested activities will ever think the same again � and will be all the better for it!" Stanley Krippner, PhD, professor of psychology, Saybrook Institute, co-author, Dreamworking, Personal Mythology, Healing States. "Intuition is one of the most powerful tools we have to assist each of us in moving out of our comfort zone, giving us insight to create the kind of things that are needed to continually re-invent our personal and business growth. 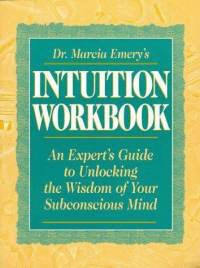 Dr. Emery reinforces that the more you use intuition, the more confidence and trust you have in it." "Success in today�s rapidly changing complex environment requires both powerful thinking and well developed intuitive abilities. This book is a must read for those interested in developing their intuitive abilities and integrating both thinking and intuitive power." "Dr. Emery�s book is practical and comprehensive. It fulfills a real need for those who wish to link super-sense with common sense in conducting their daily lives. With much care and thoroughness, she has created an authoritative guide for getting spirit and mind to operate in tandem." "Readers seeking to explore and develop their intuitive abilities will find Marcia Emery�s firm but helping hand guiding them in simple and effective exercises in Dr. Marcia Emery�s Intuition Workbook. Even the faint of heart, who fear they might be wrong or probably don�t have any such ability, will be stimulated." "Dr. Marcia Emery has created an excellent training manual for cultivation of intuitive skills within organizational and business settings. This book is filled with both practical tips and deep wisdom for those wishing to access the fullest potential of the mind-brain system. Many esoteric ideas are presented in easy to understand language. Readers will find Dr. Marcia Emery�s INTUITION WORKBOOK to be an invaluable resource for stimulating intuitive breakthroughs."